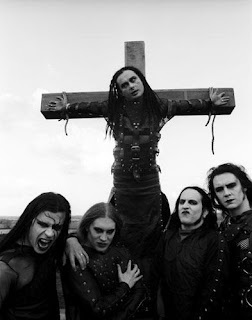 Cradle of Filth are an extreme metal band from Suffolk, England formed in 1991. The band's musical style evolved from black metal to a cleaner and more "produced" amalgam of gothic metal, symphonic black metal and other extreme metal styles, while their lyrical themes and imagery are heavily influenced by gothic literature, poetry, mythology and horror films. The band has successfully broken free from its original niche by courting mainstream publicity (often to the chagrin of its early fanbase), and this increased accessibility has brought coverage by the likes of Kerrang! and MTV, frequent main stage appearances at major festivals such as Ozzfest, Download and even the mainstream Sziget Festival, and in turn a more "commercial" image. They have sometimes been perceived as Satanic by casual observers, although their outright lyrical references to Satanism are few and far between, and use of Satanic imagery has arguably always had more to do with the shock value than any seriously-held beliefs. Cradle of Filth's first three years saw three demos and a rehearsal tape recorded amidst the sort of rapid line-up fluctuations that have continued ever since (Cradle has generally had around half a dozen members at any one time, but can boast more than twenty musicians in its history). The band also recorded an unreleased album entitled Goetia prior to the third demo and their style shift. Goetia was set for release on Tombstone records, but all tracks were wiped when Tombstone went out of business and could not afford to buy the recordings from the studio. The band eventually signed to Cacophonous Records and their debut album, The Principle of Evil Made Flesh, was also Cacophonous's first release in 1994. A step up in terms of production from the rehearsal quality of most of their demos, the album was still nevertheless a sparse and embryonic version of what was to come, with lead singer Dani Filth's vocals in particular bearing little similarity to the style he was later to develop. The album was well-received however, and as recently as June 2006 found its way into Metal Hammer's list of the top ten black metal albums of the last twenty years. Cradle's relationship with Cacophonous soon soured; the band accusing the label of contractual and financial mismanagement. Acrimonious legal proceedings took up most of 1995, and the band finally signed to Music for Nations in 1996 after only one more contractually obligated Cacophonous recording: the EP Vempire or Dark Faerytales in Phallustein which, it has since been conceded, was hastily written as a Cacophonous escape-plan. Despite the circumstances of its release however, its handful of tracks are staples of the band's live sets to this day, and "Queen of Winter, Throned" was listed among twenty-five "essential extreme metal anthems" in a 2006 issue of Kerrang! magazine. The EP also marked Sarah Jezebel Deva's debut with the band, replacing Andrea Meyer, Cradle's first female vocalist and self-styled "satanic advisor". Deva has appeared on every subsequent Cradle release and tour, but has never been considered a full band member, having also performed with The Kovenant, Therion and Mortiis, and fronted her own Angtoria project along with Cradle's current bass player, Dave Pybus. 2004's Nymphetamine was the band's first full album since The Principle of Evil Made Flesh to not be based around any sort of overarching concept (although references to the works of H. P. Lovecraft are made more than once). Thornography, was released in October 2006. According to Dani Filth, the title "represents mankind's obsession with sin and self... An addiction to self-punishment or something equally poisonous... A mania." On the subject of the album's musical direction, Filth told Revolver magazine, "I'm not saying it's 'experimental', but we're definitely testing the limits of what we can do... A lot of the songs are really rhythmical - thrashy, almost - but they're all also really catchy." A flurry of pre-release controversy saw Samuel Araya's original cover artwork scrapped and replaced in May 2006, although numerous CD booklets had already been printed with the original image. Thornography received a similar reception to Nymphetamine, garnering generally positive reviews, but raising a few eyebrows with the inclusion of a cover of Heaven 17's "Temptation" (featuring guest vocals from Dirty Harry), which was released as a digital single and accompanying video shortly before the album. According to a 2006 issue of Metal Hammer magazine, they are the most successful British heavy metal band since Iron Maiden. Long-term drummer Adrian Erlandsson departed the band in November 2006. According to an official Roadrunner press release, Erlandsson left with the intention of devoting his energies to his two side projects Needleye and the now-defunct Nemhain: "I have enjoyed my time with Cradle but it is now time to move on. I feel I am going out on a high as Thornography is definitely our best album to date". He was replaced on the 2007 world tour by Martin Škaroupka. Cradle of Filth announced in early 2008 that their eighth studio album was underway: "The world tour for the Thornography album, which last saw COF in Russia, Ukraine, UK, Romania, Slovakia and North America with GWAR is now complete [and] the band has returned home to start writing for a new record over the dark months in the rehearsal room.